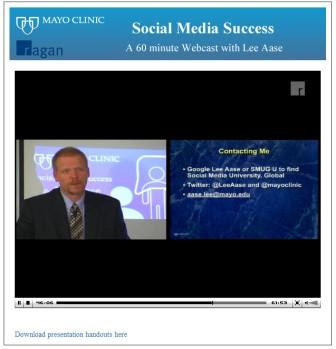 If you're curious about witnessing Simple Marketing in Action, and have one hour available, then definitely view this video rebroadcast of Mayo Clinic's Lee Aase from Ragan.com. In it, he describes his journey using social media to generate word-of-mouth referrals and achieve results for the Mayo Clinic. Lee Aase is Communications Manager for the Mayo Clinic. But, that's not all. He's also Chancellor of SMUG, Social Media University, Global where his passion for what social media tools make possible knows no limits! I encourage you to explore SMUG and discover more. In listening to Lee, I quickly realized that he is a kindred practical marketer. He even titled his presentation "The $4-a-week Newsroom and Other MacGyver Tips" [here is a pdf of Lee Aase's 8/4/09 presentation slides] - wouldn't you agree that MacGyver is as practical as they come? [Here is a slideshare of Lee's 8/13/09 LifeScience Alley presentation: "Leveraging Social Media to Reach Customers and Improve Organizational Effectiveness: The Mayo Clinic Perspective" with similar information, but additional references]. I particularly admire how he and the Mayo Clinic have made such good use of a gem of a tool - the Flip Camcorder - to easily capture and showcase Mayo Clinic researchers' and physicians' expertise and share it via social media platforms. Mayo Clinic uses video as a key ingredient of its content and communication strategy. 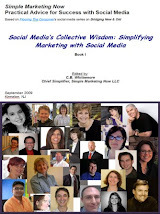 + Get comfortable with social media tools. Figure out how they work. These are low cost tools and, if used effectively, can help you achieve results. + Word-of-mouth represents an important source of referrals for the Mayo Clinic. Social media combines the reach of traditional news with the power of personal recommendation to reach users directly. + It costs little to nothing to use social media platforms, but you do need to develop expertise and experience to use those tools effectively. + Don't [just] pitch the media, BE the media. Final words of wisdom: Social media represents a vehicle for taking advantage of opportunities. You don't need to be a genius and it's not hard to do. The tools are easy to use and they make current work more effective. Leverage media relations. Get personal hands-on experience. Understand what the tools do, gain confidence, and then do it. Thanks so much for your kind words and great review. Our school motto for SMUG is Suus Non Ut Difficile (It's not that hard!) so that does fit with what you advocate. Glad to make connections. Lee, you are welcome and thanks for being so committed to showing the world that Suus Non Ut Difficile. Very pleased to connect, too.